DOJ inspector General Michael Horowitz has released a scathing report detailing multiple lies, the majority under oath, told by former FBI Deputy Director Andrew McCabe before he was fired. The report shows McCabe lied on multiple occasions under oath and to inspector general and FBI investigators about the FBI's criminal investigation into Hillary Clinton, the FBI's investigation into the Clinton Foundation and more. He is found guilty in the report of improperly leaking sensitive information to the Wall Street Journal, which he then lied about and misled former FBI Director James Comey. "The OIG found that then-Deputy Director Andrew McCabe lacked candor, including under oath on multiple occasions in connection with describing his role in connection with a disclosure to the WSJ, and that this conduct violated FBI Offense Codes 2.5 and 2.6. The OIG also concluded that McCabe’s disclosure of the existence of an ongoing investigation in the manner described in this report violated the FBI’s and the Department’s media policy and constituted misconduct," the report states. McCabe was fired by Attorney General Jeff Sessions last month after the FBI Office of Professional Responsibility and inspector general recommended he be terminated from his position for a lack of candor. After his firing, which put his government pension in jeopardy, McCabe hired a D.C. lobbying firm to set up a legal defense fund. He quickly raked in more $500,000 and the page was promoted by Democrats. Outgoing Oversight Committee Chairman Trey Gowdy says the report further backs McCabe's justified firing. 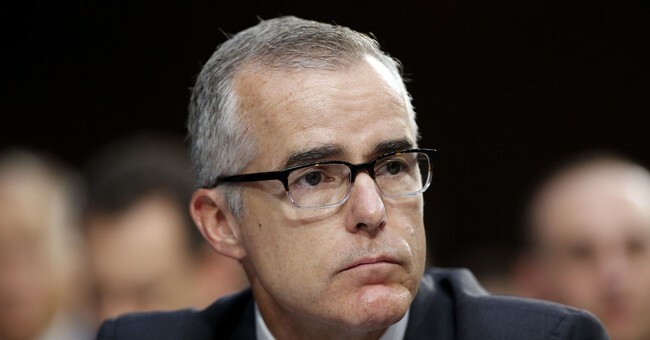 "Today's Inspector General report confirms FBI Deputy Director McCabe's firing was justified. The second in command at our nation's premiere law enforcement agency should be the epitome of fidelity, bravery and integrity. The Inspector General found not only did McCabe divulge sensitive information, he did it without the permission, authority, or knowledge of his supervisor. The report also found a lack of candor both while under oath and while not under oath, and a failure to remedy his lack of candor despite multiple opportunities," Gowdy said. "This report continues to call into question decisions made by FBI leadership in 2016 and 2017, which is why the Oversight and Judiciary Committees will continue our joint investigation into the matter," he continued. "I remain fully confident in the professionalism, thoroughness and fact centricity of Inspector General Horowitz, and look forward to reviewing the Inspector General's full report in May."